Facing criminal charges is probably the most challenging times in the life of the accused. Never go alone when facing criminal charges. Putting your criminal case in the hands of an experienced criminal defense attorney will give you the best possibility of success in your case. Hiring a heavyweight Modesto criminal defense lawyer fight the powerful government on behalf of the accused. Being accused and charged with a crime is life altering and there is no room for delay when deciding whether to hire an attorney. 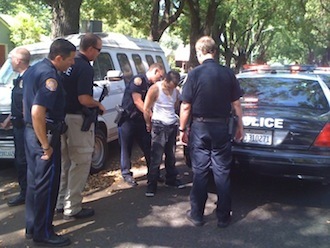 Facing criminal charges in Modesto? If you face criminal charges in the Modesto area you need an attorney. In addition if you are the subject of a criminal investigation by Modesto Police Department, Stanislaus County Sheriff’s Office, or other law enforcement, you should consult with a lawyer. At any phase of the criminal investigation and prosecution an aggressive criminal defense lawyer would benefit you. The decision of whether to fight the case to trial is ultimately your decision. However, an attorney can help you weigh the costs and benefits of negotiating a plea or going to trial. The first goal of The Bogan Law Firm, A Professional Corporation is to help you avoid criminal convictions. When avoiding a criminal conviction is not possible, the next goal is the seek a resolution is the most beneficial to the you under the circumstances. The Bogan Law Firm, A Professional Corporation offers a full service criminal defense firm for you. Below are some of the more popular areas of criminal defense that we practice. The crime you are charged with may not be on this list, but almost certainly we have experience defending your type of case. Attorney Tai C. Bogan has always worked aggressively for the defense, never for the government. Aggressive criminal defense includes a willingness to go to trial when necessary and a thorough criminal defense investigation. A winning strategy and personalized attention to each client bolsters the already stellar reputation of the firm. Facing criminal charges is probably the most challenging times in the life of the accused. Hiring a heavyweight Modesto criminal defense lawyer fight the powerful government on your behalf should give you piece of mind. Contact the Bogan Law Firm at 209-565-3425. OUTSTANDING! Responsive! Responsible! Committed! Professional! Credible! The BEST! No one can compare! I am still amazed and thankful at how well Tai did in representing my loved ones. I highly recommend Tai to everyone! Mike M.
When things looked like there was no way out Tie came and made everything go away. When it seemed like I was one step in prison with all my 7 criminal charges, Tai found a way to show my innocence in trial. Can't thank him enough. Best lawyer in the county of San Joaquin. Edwin H.
The Tai Bogan Law Firm is a solid and dedicated group of Professionals who Passionate about what they do. They are relentless in achieving the very best out come for their clients... I highly recommend you speak to Tai before yo go anywhere else... Tony C.
Thank you for helping me close a chapter in my life that has been hanging over my head for years. I now have a clean start to a new chapter. Thank you so much for helping me expunge my record so quickly and painfree...no headach or worries. You are awesome! Dannaka D.
We serve the following localities: San Joaquin County, Lathrop, Lodi, Manteca, Stockton, Tracy, Stanislaus County, Ceres, Denair, Modesto, Oakdale, Patterson, Riverbank, Turlock, Waterford, Contra Costa County, Concord, Richmond, Merced County, Livingston, Los Banos, Merced, Sacramento County, Elk Grove, and Sacramento.